Author(s) Watt, Jeremy; Borhani, Reza; Katsaggelos, Aggelos K.
Providing a unique approach to machine learning, this text contains fresh and intuitive, yet rigorous, descriptions of all fundamental concepts necessary to conduct research, build products, tinker, and play. 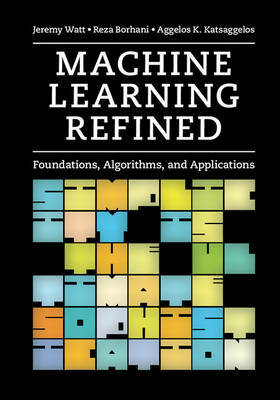 By prioritizing geometric intuition, algorithmic thinking, and practical real world applications in disciplines including computer vision, natural language processing, economics, neuroscience, recommender systems, physics, and biology, this text provides readers with both a lucid understanding of foundational material as well as the practical tools needed to solve real-world problems. With in-depth Python and MATLAB/OCTAVE-based computational exercises and a complete treatment of cutting edge numerical optimization techniques, this is an essential resource for students and an ideal reference for researchers and practitioners working in machine learning, computer science, electrical engineering, signal processing, and numerical optimization.